Magic Leap is one of the most intriguing secrets in augmented reality tech right now. You can piece it together from the rumors and hearsay, but questions still remain. 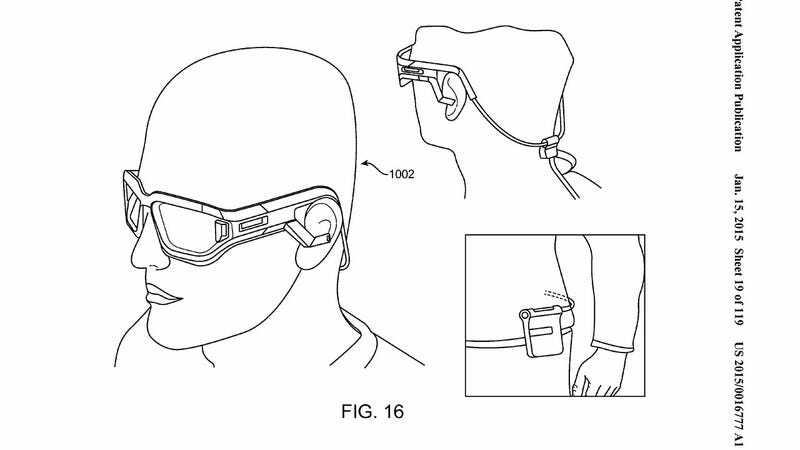 If these recently-published patents are any indication, the Magic Leap future involves a lot of insane wearables. Posted on the U.S. Patent & Trademark Office website on Thursday, these patents are interesting if only for the fact that they give us at least some idea what Magic Leap is thinking in terms of its AR interface. The patents cover possible leisure, commercial, medical and fitness applications for the proposed headset (pictured above), and they are pretty out there. Let's take a tour. Here's a look at how AR could turn our hands into controllers. I like that "productivity" is the middle finger, fwiw. ...and going grocery shopping. "Gerald was hiding behind cucumbers?" Enough. With. The. Cucumbers. It will bring us all into a new world of gesture-based laziness. It could also help patients better understand their health. Monsters might also bust out from behind big-box shelving. Wow, what a future! Although these are patents and every single patent should be consumed with a healthy dose of "I'll believe it when I see it" skepticism, a developer model of Magic Leap's headset may not be that far off. According to Business Insider, multiple sources say that a developer version could be available in about a year. So whether or not all of this really play out like these surreal black-and-white images, who's to say. But it's a safe bet that the future is so bright, you'll have to wear shades.